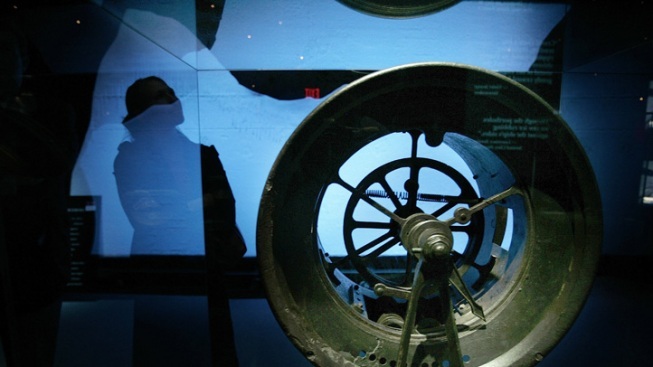 A telegraph wheel from the Titanic was displayed in a 2006 exhibit on in San Francisco. An upcoming exhibit at the National Postal Museum (2 Massachusetts Ave. NE) will celebrate two transportation marvels, and their related disasters. Both the Titanic and the Hindenburg served demands for rapid worldwide communication and transportation. Both operated as the world's largest mobile post offices. Each in its day promised the fastest possible worldwide mail service. Each offered onboard gentility and opulence. Each met a tragic end. Next year will mark the 100th anniversary of the Titanic's sinking and 75 since the Hindenburg crashed. The exhibit will run through Jan. 2013.